Celebrating and sharing ways of creating safe spaces for all, and rededicating ourselves to bullying-free schools. The Woburn website is designed to communicate the latest up-to-date information about the school with our Woburn school community. By visiting our website regularly, you will gain information about Woburn, special school programs, student and staff accomplishments, important dates, school policies, school council news and more! 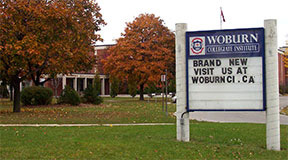 Currently, the Woburn website is used by over 1200 students and alumni. If you have not already done so, we invite you to take a tour of our website. Woburn is yours to discover!